[NB: I’ve tried to (simply) reflect incremental buys & sells by calculating an average stake size. This also allows me to calculate a weighted average gain for the portfolio, to reflect the contribution of my specific portfolio weightings. I haven’t included dividends for the moment, and I continue to ignore foreign exchange rate changes. Not to suggest FX is unimportant – in fact, I encourage you track & diversify your currency exposure – but it’s a separate exercise & readers have multiple base currency perspectives anyway. If you wish to drill down, I’ll include a copy of my Excel file below – it will also include links to each corporate website]. Why didn’t I just buy into the best market(s)? Er, how..? Very few of us can actually manage that bloody feat! In fact, I’m resigned to generally being in the middle of the pack – there will always be markets & investors who outperform me, sometimes substantially. But many of those investors are simply enjoying the fruits of a gigantic dose of home bias, and they forget how savagely this bias can treat them on other occasions. I can’t & don’t want to take that kind of risk, knowingly or unknowingly – my aim is to diversify my portfolio as much as possible. In fact, ideally, I’d like to diversify away from the stock market & the economic cycle altogether (with Alternative Asset Opportunities (TLI:LN), for example). This inevitably means selective under-performance in the short-term, but will hopefully produce superior & consistent performance in the long run. Why didn’t I buy more of my best stocks? Again, how? Weighting your portfolio towards your best ideas is generally a good idea, but one is always surprised by the best & worst performers in any one period! This is one of the best arguments there is for a widely diversified portfolio, regardless of your conviction level in your best ideas. You also have to think about the risk & correlation implications of each stock within your portfolio. For example, I limited my holding in Sirius Real Estate (SRE:LN) because of my already large exposure to German (residential) property, via KWG Kommunale Wohnen (BIW:GR). I also sold down my stake in Livermore Investments Group (LIV:LN) because their core portfolio’s focused on CLO residual equity tranches – this is a highly leveraged investment, and LIV’s also potentially highly correlated with my holdings in Tetragon Financial Group (TFG:NA) & Fortress Investment Group (FIG:US). On the other hand, the large gains in FIG, LIV & FBD Holdings (FBH:ID) in both 2012 & 2013 are a (galling) reminder to actually believe in & bet on your strongest convictions (& price targets)! Once they get started, shares often run far higher & longer than you might ever expect… Also, averaging up is usually far better than averaging down – definitely a difficult (but v profitable) lesson for any value investor to learn! Why on earth didn’t I just avoid my dud stocks? Another tough proposition… And for many years this is where most investors’ greatest failures (& lessons) will be realized – because, in reality, faulty analysis and/or poor judgement are usually to blame. The solution for both is pretty simple, but difficult: Checklists, and reading, reading & more reading! Fortunately, with my other stocks, I believe I’m mostly just seeing noise. However, Avangardco (AVGR:LI) is a classic example (rightly, or wrongly) of a particularly reviled & neglected company – while I clearly think it’s a cheap high growth stock, it’s probably a good idea to limit such holdings unless you’re prepared to absorb significant pain & losses (ideally, on an interim basis!). I look at my entire portfolio & continue to be hugely enthused about its prospects. I particularly focus on KWG Kommunale Wohnen, Alternative Asset Opportunities & European Islamic Investment Bank (EIIB:LN). 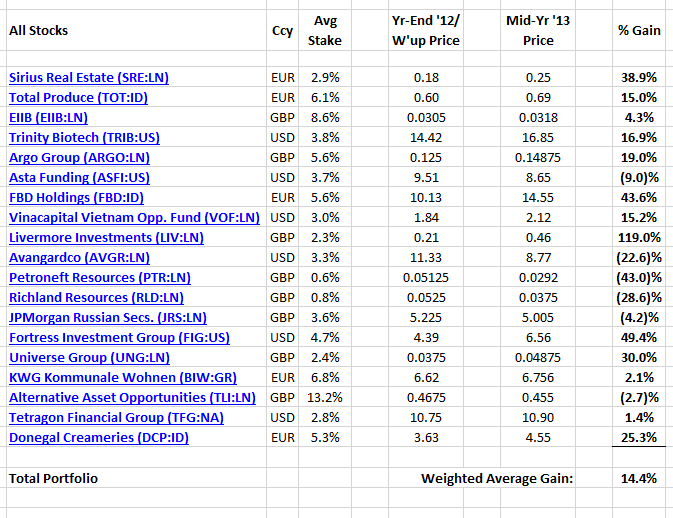 These are my largest holdings & comprise a full third of my disclosed portfolio, but ironically they’ve produced pretty much zero returns year to date!? However, this hasn’t affected my evaluation of their respective fundamentals an iota – I still believe each stock offers substantial (unrealized) upside potential, while also providing exceptional low(er)-risk diversification. It’s amazing, that tetragon seems to avoid further CLOs at the right time and their share price underperforms. I might consider tetragon if price falls further. management seems to be prudent. Yes, these boys are pretty smart – if you look back, their historical CLO selection was also much better than average (in terms of defaults, etc.). Unfortunately, the TFG chart continues to look a little sickly. And now it looks like key $9.95 support’s breached – we might see $9.25 next. But that would put them on a 0.56 Price/Book – pretty silly in absolute & relative terms! Very exciting stuff, esp. page 26! Avangardco announced in their Q3 update dividend: 25% of net income. Yes, good news Stefan – and a pretty attractive dividend yield! I’d prefer to see a share buyback myself, but at this point I think the payment of a dividend will provide a more effective signal to the market re AVGR’s underlying intrinsic value. is more expensive than avangardco? Business model is very similiar, but leverage is much lower than at Avangardco. Avangardco is bigger, cheaper and more profitable so far in 2013. Martin – to answer another way, no I don’t know why Avangardco is trading so cheaply (but $11 is a lot nicer than $8!) – the usual reason cited is, of course, Bakhmatyuk’s controlling stake. I’ve noted a few Polish-listed agri-companies, but haven’t really analyzed or contemplated buying anything on that exchange as of yet. Thanks, though, I’ll take a note of Ovostar. Wexboy, thanks for your reply. Ovostar is not polish. It describes itself as one of the leading egg and egg products producers in Ukraine. Main shareholder is Prime One Capital with 72% – it can’t be the controlling stake argument. Ovostar is very very simliar to Avangardco and the best peer by far I could find. I am long Avangardco, but I am puzzled by the different price of these two businesses. Ovostar has no leverage but premium is too high to justify. Ovostar seems to have the better domestic egg brand, too. Insider Prime One Capital sold 2% recently. I may simply double up my avangardco position or find a way to short Ovostar. Yes, I know it’s not Polish – actually there’s at least half a dozen Ukrainian/Russian agri-businesses that listed on the Polish exchange. I simply haven’t contemplated buying anything Polish (or Russian/Ukrainian) listed as of yet, for a couple of reasons – my loss, I guess. The production sites description is interesting – Avangardco highlights the geographical diversity of its sites across the Ukraine, which I think is another key point in their favour. I’m not as concerned about relative domestic market share, as I ultimately view Avangardco as a lowest-cost export play. [I’m impatiently waiting for an update on EU approval/entry, but at least they continue to report excellent growth in existing & other new export markets]. I wouldn’t be so puzzled about the relative market valuations – sometimes they’re justified, but market often throws up crazy anomalies…it’s not that efficient! 😉 However, spending more time using Ovostar financials to compare & contrast with Avangardco is time well spent – either confirms Avangardco’s margins & metrics, or challenges you to discover why they’re different – I’ll be looking at Ovostar next time I take a closer look at Avangardco, thanks. Thanks, Joe – yes, here’s hoping!